The Dave Thomas Foundation for Adoption believes that no matter how families are formed, new parents need time to bond with their children. Through the Foundation’s Adoption-Friendly Workplace program, organizations can find resources to implement adoption-friendly policies. Each year the Foundation surveys the United States to find the best adoption policies. The 2018 survey just closed, but it’s never too late to become adoption friendly. If you’d like to take part in our 2019 survey, email info@davethomasfoundation.org to have your organization added to the distribution list. 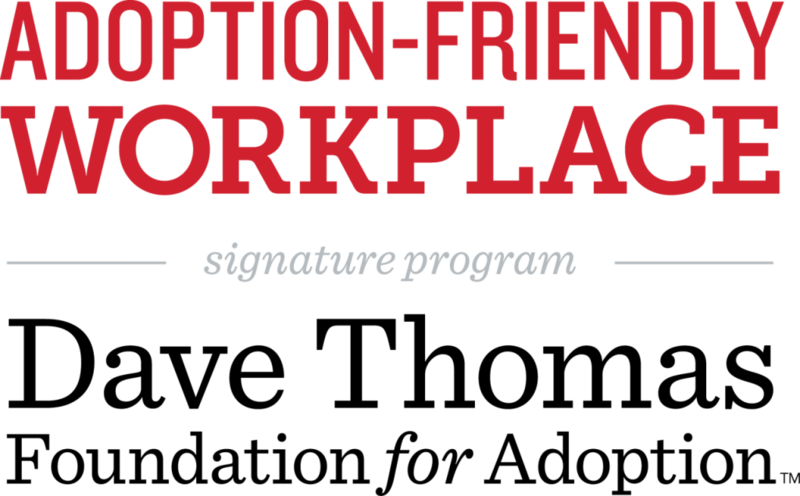 To see the 2017 Top 100 Best Adoption-Friendly Workplace list, click here. To learn more about how to make your organization adoption friendly, visit their website here. Adoption Choices of Kansas is proud to acknowledge all organizations who support adoption. The Dave Thomas Foundation for Adoptionhas one mission: to dramatically increase the number of adoptions from foster home. Our evidence based child-focused recruitment model is up to 3 times more effective in finding loving, permanent homes for the children who need them the most. Learn more about their vision to find a loving family for every child at davethomasfoundation.org.